Jennifer Aniston finally became engaged to Justin Theroux. There have been rampant rumors that Aniston is a control freak and that Theroux is merely making footprints in the sand on her Malibu beach because he’s terrified of the actress. We have to add, we’re not really surprised that the engagement happened so quickly after those dodge rumors and European trips to the Vatican, but we’re taking this one step further and pointing our dirty laundry fingers at Aniston. Is she going to, somehow, screw this engagement up? Yes, Aniston did not notify her mom Nancy Dow and dad John Aniston of the engagement, due to now obvious emotional scarring, but why did the engagement happen so quickly? Why did they get engaged if they have issues to work on? Why does The Bachelorette always have dramatic rose ceremonies? These are the rhetorical questions for which we have no answers, but we can merely speculate as to why Aniston and Theroux decided to head for the altar. Theroux might have agreed to get engaged to Aniston in order to keep her mouth shut. Seriously now, do you not think living with Jennifer Aniston will send you running for Nicole Kidman’s neurotic hills? Yes, there might be some semblance of love in the chiseled Theroux heart and we bet Aniston uses his face as a map to find Gremlins in the dark, but they never looked entirely happy. This Shakespearean tragedy began one fine morning when the then non-stereotypical Brad Pitt did a terrible little film called Mr. and Mrs. Smith with the one-legged demon named Angelina “My-eyes-are-so-bootiful” Jolie. Brad and Angelina Jolie became the hottest celeb couple in human history (they even outshone Princess Diana and ol’ Charlie Windsor). Brad left the poor Aniston crying in a bathtub filled with candle wax and insecurity and adopted a small African country with Angelina. Aniston’s life was then filled with romantic faux pas straight out of a Rob Reiner film, complete with Danielle Steel plot devices. She flipped from man to man like a manic baby playing hide and seek and eventually ended up with her dream face, Justin Theroux. Her nostrils were filled with the scent of man and she cackled like a loon on a muddy Los Angeles day. They were meant to be, she believed, and as God as her witness she went all Gone with the Wind on his life. Theroux, in the meantime, has been using a daily mantra in order to get through the terrifying claustrophobia which Aniston so gently instills in men. He meditates each morning and mutters, “FML. FML. FML. FML. Safe words. FML”. If you are unfamiliar with this pop cultured phrase, FML doesn’t stand for Female Male Love, but rather F**k My Life. Yes, Theroux, Aniston has FYL quicker than the tears in a Jolie drama. What does this horror story teach us? Theroux might not be suffering from The Notebook paranoia which Aniston is a victim of, but might rather be experiencing a case of Anistophobia — the deadly fear of entering into a relationship with a woman made by insecure elves. Let us sum this up for those celebrity challenged folks who are reading our site — like Honey Boo-Boo taking an etiquette class in hell, Theroux is a victim of Aniston’s madness. Not even The Curious Case of Benjamin Button can save this relationship from old Brad Pitt babies and ruin. 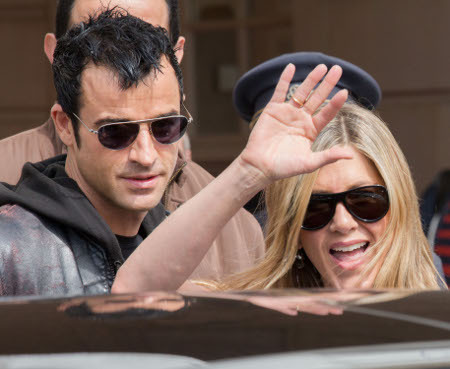 What are your thoughts on the Jennifer Aniston and Justin Theroux engagement? Is Theroux a victim or are they happily engaged? Let us know in the comments below. Jennifer Aniston’s Big Fat French Wedding Revealed!